The Olney Lace Circle have taken part in a number of lace projects in the past and we have just finished a poppy field scene to commemorate 100 years since the end of the First World War. Our deadline was summer 2016, so that the picture could be assembled and framed in time for our AGM in November. Andrea and Lesley were thrilled with the positive response from the members and poppy petals were falling into their hands like confetti. 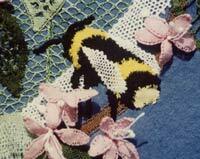 Apart from the poppies of various sizes, the finished scene also included ears of corn and green leaves. the completed picture is stunning..
Below are photos of some of the elements of the picture and the bottom photo shows the proposed end result. Andrea Wood, the Chair of the Lace Circle had the idea for the project back in 2014 when she visited the Poppy installation at the Tower of London - "Blood-swept Lands and Seas of Red". Our picture is entitled "Peace After a Storm" - after an Olney Hymn by William Cowper. Initially ,Andrea thought that the picture would commemorate the centenary of the First World War but then thought that it would be good for people just to enjoy a beautiful picture and have a quiet moment of reflection. She felt "It should represent whatever the viewer wished it to". 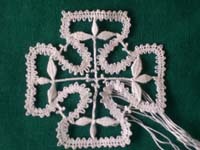 After many months of research, gathering various threads, sourcing and trialing various patterns designed by our tutor, at the time, Lesley Hancon, the members started making lace. Both Andrea and Lesley were overwhelmed by the enthusiasm of the Lace Circle members and before long poppy petals were coming in thick and fast. Many hours have gone into each poppy petal, leaf and ear of corn. 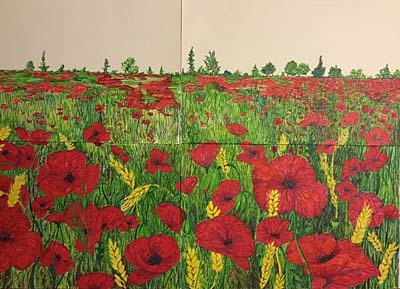 The background for the poppies was painted by Lesley in acrylics on calico. 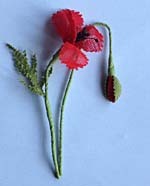 The poppies and corn were then applied alongside beads representing swathes of poppies in the background. Andrea and Lesley are incredibly proud of all the members who have contributed to help them achieve the finished picture. They also hope that the patients and staff of Willen Hospice enjoy the work of the Olney Lace Circle and that it brings hope, reflection, enlightenment, joy and inspiration and all find "Peace after a Storm"
The photos above show the presentation of 'Peace After The Storm' to representatives of Willen Hospice. If you would like to read some of the related articles from the local press, please visit the following websites. Our previous major project was for the QUEEN"S JUBILEE YEAR. 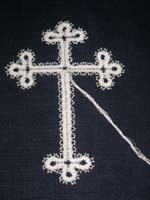 Our Chairman, at the time, Diana Tybjerg came up with the idea of creating a montage of lace crosses which would be presented to the Sisters at St Joseph's Convent, where we meet each week. 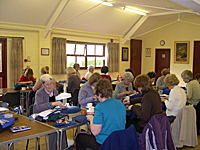 Once completed, Diana presented the montage to the Sisters at our AGM in November 2014. 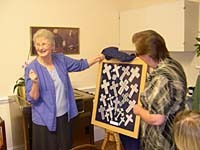 Below are a few photos of finished crosses, followed by the finished picture and its presentation to Sister Rita. 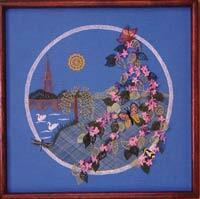 At the 1986 AGM, a member thought it might be a good idea for the Lace Circle to design and make a piece of modern lace which might then be donated to the Cowper and Newton Museum in Olney. 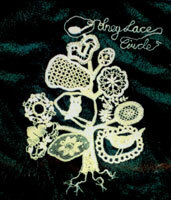 The 'piece of modern lace' became a set of four pictures, each interpreting one of the four seasons. Lesley Hancon designed and organised the making of these pictures. The first picture to be worked, was 'Summer'. It depicts the bridge and church of Olney - a scene which has been painted many times through the years. The finished picture measures 2 feet square and has a 3-D effect created by the blossom on the tree being made of individual petals standing proud of the background as do the wings of the butterflies and dragonfly. The second picture depicted Winter. The view is from a window in the Cowper and Newton Museum and looks out onto the Bull Hotel in the High Street with a Christmassy theme. The robin has a padded body, the candle is also raised and the Christmas roses and the ivy stand away from the background. 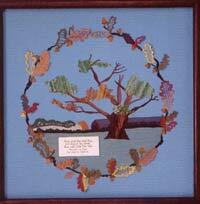 The Autumn picture is of Cowper's Oak, which is no longer in existence. 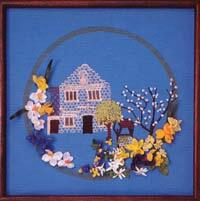 The Spring picture is of the Lace Factory in the High Street with spring flowers in the foreground. Click here to see a photograph of the actual building. The time spent on all four pictures probably exceeds 2,000 hours. The Lace Circle have gained a great deal from this project - fellowship, confidence to attempt more challenging work and using colour for the first time! 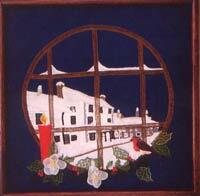 The four pictures were handed over to the Cowper and Newton Museum. 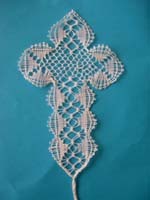 They are on display in the Museum alongside examples of old lace. In 1992 Olney's Community Centre, was re-opened by The Duchess of Kent on 1st October. 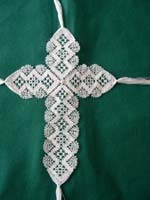 The Lace Circle was asked to demonstrate lace on that during the visit and also to make an item of lace which could be presented to Her Royal Highness. As the Duchess was to be presented with a copy of The Olney Hymns by John Newton, we decided that a bookmark would be appropriate. 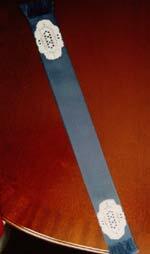 Two identical Bucks Point motifs were mounted, one on each end, on to ribbon. The Duchess of Kent seemed thrilled to receive the gift and showed great interest in our lace making. 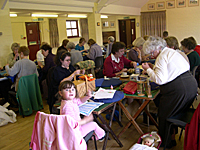 The Olney Textile Map was a community based project undertaken for the Millenium. Contributions came from many different groups within the town, resulting in the production of a map of Olney using a variety of techniques and styles. This map is on display at the Olney Community Centre, High Street Olney. 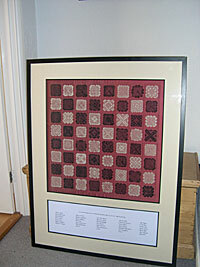 For our Silver Anniversary in 2004, we decided to make a chessboard featuring lace squares in black and white which could involve everyone in our group Each member, including the children, completed two squares each. 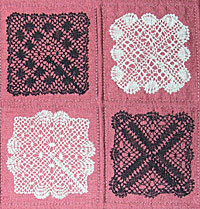 Our resident designer and secretary (at the time), Lesley, created 32 patterns, each one was to be worked in ecru and black, making 64 squares altogether. 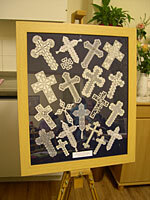 Everyone enjoyed the project and as soon as some of the pieces were finished Lesley began mounting them. 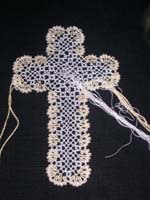 The work in progress was on display at our 25th Lace Day in September 2004. 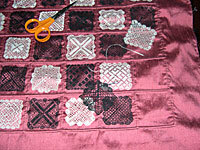 A close up picture of four of the squares and a larger view showing the almost finished piece. The completed wall hanging with all the names of the contributors printed below. As soon as the last square was in place, the finished article was taken to be framed so that it would be available for all the members to see at the AGM in November. The project is now completely finished and the result is a beautiful framed wall hanging which is publicly displayed in 'The Olney Centre' situated in Olney High Street. 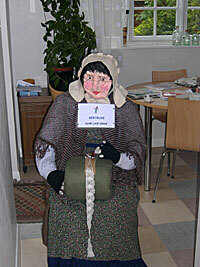 A scarecrow exhibition was organised in Olney the same year and the Lace Circle were invited to contribute. 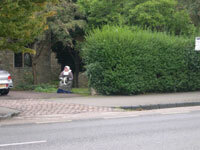 Below are the photographs of our 'Lace Lady' sitting outside the Lace Factory building. I think you'll agree that Diana and Lesley created her beautifully.